Cut out the paper template, place it on the large piece of plywood, lining up the bottom with the edge of the wood, and trace the outline onto the wood. Drill holes into each corner, on outside of the lines (this will help when cutting out the template with the jigsaw). Be careful – you don’t want holes in the tree itself. Cut out the Christmas tree with a jigsaw and sand the edges. Drill a hole near the top point, from which to hang the tree. Find the centre of the bottom of the tree and mark it. Then mark 6 mm on either side of this mark. Mark 15 mm down from the top (you are going to cut out a slot). Cut along the 6 mm lines down to the 15 mm mark. Using the chisel, remove the wood between these cuts. On the 120 mm x 30 mm piece of wood, do the same – find the centre and mark 6 mm on either side of it. Cut down to 15 mm and remove the piece of wood with the chisel. Apply glue to the slots on both pieces of wood and glue them together. Find the centre of the 172 mm x 172 mm piece of wood and drill out a hole with the hole saw. Fix the square to the top of the bottom strut of the tree using panel pins and glue. When the glue is dry, paint the tree with a coat of undercoat. Leave it to dry and then paint two coats of PVA, allowing the paint to dry between coats. Pot up your asparagus and pop the pots into the hole. Hang your new Christmas tree in a prominent spot that will fill your home or patio with festive cheer. 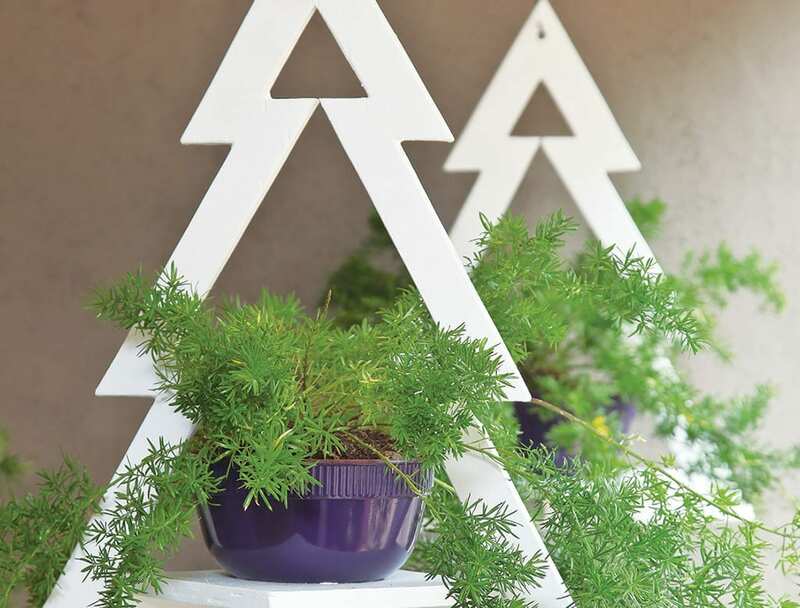 This entry was posted in DIY and tagged Christmas, Decor, do-it-yourself. Garden well and still save water? You can do it! Stunning. You can make different shapes so that they can be used after Christmas.